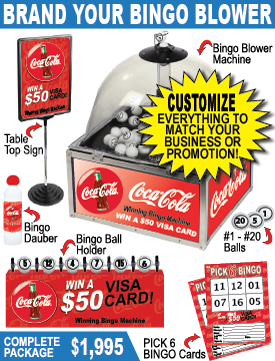 The Bingo Blower game is the perfect event attraction to generate excitement about your business. 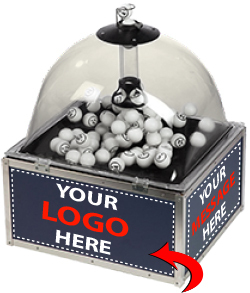 Create thrilling promotions with The Bingo Blower! Trade shows and product launches are often the biggest events of the year for a brand. Providing an engaging activity at your event creates enthusiasm about your company. We're experts at drawing crowds, so you can turn them into clients! The secret to a successful promotion is to do something out of the ordinary, something that promotes participation and gets the crowd buzzing. The interactive nature of The Bingo Blower gives players the chance to converse with you and each other about your brand, even after your promotion is over. This ability to create a conversational atmosphere and enhance interaction between sales teams and customers is priceless! The Bingo Blower is a Vegas-style, bubble-top blower. The clear, acrylic, dome lid is attached to the base by hinges, making it easy to add the balls. Excellent air pressure is generated by the smooth and quiet motor blower. When activated, air pressure keeps balls in a constant moving mix. One by one, balls are blown from the dome chamber upwards into the feeder where they levitate until pulled. Draw a Crowd with PICK 6 BINGO! PICK 6 Bingo supports up to 20 players per round and takes approximately 4-6 minutes to play. Each PICK 6 Bingo card features six boxes (numbers 1-20). Unlike traditional Bingo, a game win occurs when a player has all six numbers. 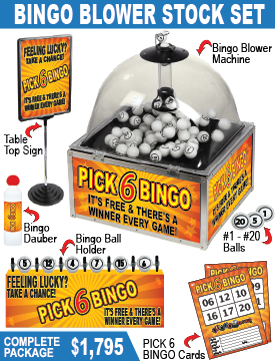 The PICK 6 Bingo game format works great for speed promotions, trade shows and raffle drawings. The Bingo Blower supports multiple game styles including traditional Bingo, number drawings, Pick 6 Bingo and other custom formats. Our Event Marketing Consultants can help custom design a game format that fits your event perfectly. Six Levels of Customization Available! 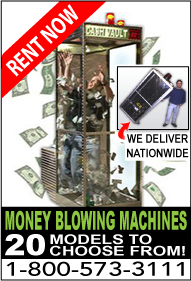 Call 800-573-3111 for a quote on a Completely Customized Bingos Blower Game. Maximize your lead generation opportunity! In recent years there has been a decline in the trend of selling products and services during shows. 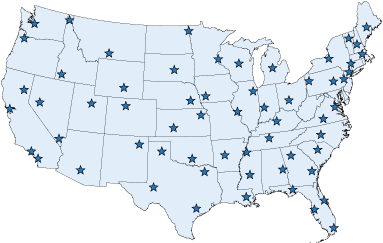 Trade shows produce decision makers and capturing those leads now ranks highest for most companies that exhibit. Thanks to development in the app market, we've seen a boom in lead capture/generation via technical tools. This new technology makes the lead capturing experience more efficient. When visitors arrive at your booth, a smart phone app is used to scan the information off visitors show badges. Big names in this app market include iLeads, ExpoBee and G2Planet. Not all trade shows offer badge scanning for lead capturing. Let us customize your PICK 6 Bingo cards to feature an information form with fields specific to your campaign. Contact forms look great positioned on the reverse side or on a perforated section. Entice players to fill out their contact information by converting their used Bingo card into a raffle entry! © 2016 BingoBlower.com all rights reserved. All prices and availability subject to change without notice, not responsible for typographical or photo errors.